Human Resources Assistant - Compiles and keeps personnel records. Records data for each employee, such as address, weekly earnings, absences, amount of sales or production, supervisory reports, and date of and reason for termination. May prepare reports for employment records, file employment records, or search employee files and furnish information to authorized persons. Human Resources Assistant career is part of the Business, Management and Administration cluster Administrative Services. Processes, verifies, and maintains personnel related documentation, including staffing, recruitment, training, grievances, performance evaluations, classifications, and employee leaves of absence. Records data for each employee, including such information as addresses, weekly earnings, absences, amount of sales or production, supervisory reports on performance, and dates of and reasons for terminations. Explains company personnel policies, benefits, and procedures to employees or job applicants. Gathers personnel records from other departments or employees. Examines employee files to answer inquiries and provide information for personnel actions. Answers questions regarding examinations, eligibility, salaries, benefits, and other pertinent information. Compiles and prepares reports and documents pertaining to personnel activities. Requests information from law enforcement officials, previous employers, and other references to determine applicants' employment acceptability. Processes and reviews employment applications to evaluate qualifications or eligibility of applicants. 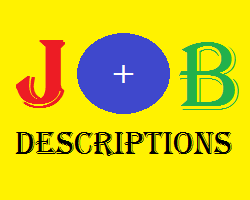 Arranges for advertising or posting of job vacancies and notifies eligible workers of position availability. Here's a list of skills used in Human Resources Assistant career that are also used in other careers. Workplace skills are practiced activities that help people become successful in all kinds of careers. Here's a list of the workplace skills that are used in Human Resources Assistant career. Belum ada Komentar untuk "Jobs Description of Human Resources Assistant"